The Gabriel® Legendary Sales Event: Rebates up to $125! From September 1 to October 31, when consumers purchase four qualifying Gabriel® products they can receive a mail-in rebate for the price of one shock/strut. Maximum rebate amount is $125. 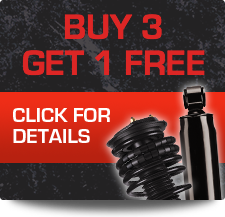 For more information, download the rebate form or speak to your Gabriel distributor. Offer valid only in the United States.